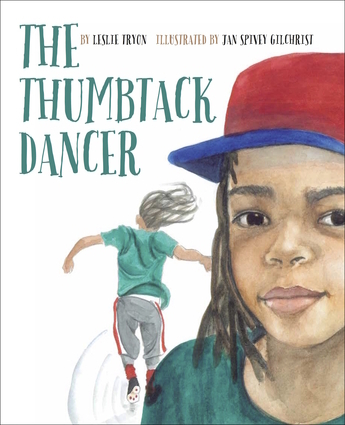 Gus is a most promising, most energetic and most talented young dancer who figures out how to make enough money to upgrade his tip-a-tap thumbtack sneakers to a new pair of real tap shoes that could slap-a-dee-dap, slap-a-dee-dap on a real dance floor. He uses his public street dancing and thumbtack shoes to tap his way down the sidewalk and right up to the big red door of the dance studio. Leslie Tryon is the author of the Albert series and several other books for young readers. She is the illustrator of Alma Flor Ada's Dear Peter Rabbit and With Love, Little Red Hen. She has received an ALA Notable book recognition, a Parents Choice Honor and an Ezra Jack Keats Award for Excellence in the Arts. Jan Spivey Gilchrist is the award-winning illustrator-author of 74 children's books, including The Great Migration: Journey to the North, written by Eloise Greenfield. Her books have been recognized by the Coretta Scott King Honors, the NAACP, the CCBC and others.